lawyer fraternity of Papum Pare District Bar Association, Yupia has also carried out protest rally. 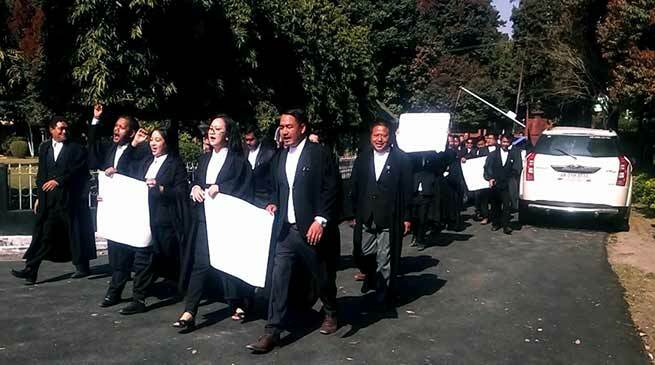 Advocates of Gauhati High Court Itanagar Permanent Bench Bar Association (GHCIPBBA) carried out a protest rally as part of the Bar Council of India’s call for nationwide lawyers’ agitation on February 12. The rally led by Mr Marto Kato, General Secretary, GHCIPBBA, started from the precincts of Gauhati High Court, Itanagar Permanent Bench, Naharlagun towards tri-junction (Hatimata) and culminated at the High Court premises. It is to be noted that the Bar Council of India called this protest march in support of their demands raised by the Bar Council of India on February 2 are medical facility; insurance; housing schemes; financial assistance to young lawyers; pension schemes; Advocate Protection Act; not to scrap Bar Council of India and State Bar Council like Medical Council of India; to amend the legal service authority Act to enable the lawyers to discharge the functions under the Act; to amend all the Acts for appointment of retired judges/ judicial officers as presiding officers in various tribunals and commissions etc. Meanwhile the lawyer fraternity of Papum Pare District Bar Association, Yupia has also carried out protest rally during the day led by Mr Taba Topu, Asst. Gen. Secretary of PPDBA, Yupia.